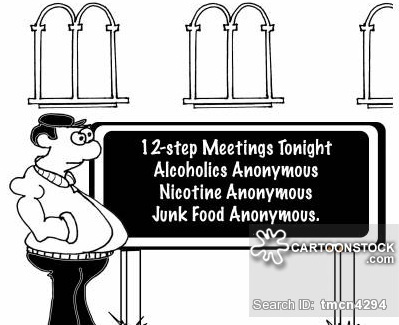 Alcoholics Anonymous was one of the first, I'm guessing, to present this long series of steps to enable one to climb out of the pit that addiction can be. My intention is not to knock them at all here. Peak Stupidity is just glad that it is not another US Government Agency, and I sure hope they don't get money, along with the strings attached, from the Feral Gov. We are all FOR private associations. 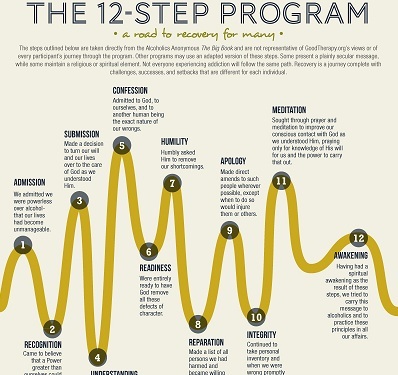 Other groups, for other problems, have adopted these multi-step programs, some of which are also pretty serious. It's the silly stuff we want to make fun of, and it the struggling AA people, or the Fear of Humidity group* get burned in this post, they'll just have to sweat it out! Peak Stupidity's current least favorite movie, Fight Club, had these support groups as a part of the plot. Ed Norton, the star and narrator, was in the habit of going to a different one each evening, I think to meet chicks. You'd think it'd be easy to pick-and-choose a girl's personality that way, but he was in it to meet girls that were also addicted to 12-step programs, I think... again, I didn't "get" this movie. BTW, it didn't work out so well (SPOILER ALERT), as he ended up with a skank. For most of these, yeah, you do probably want to remain anonymous, as it's that or we'd have put you in jail by now. "Hi, my name is REDACTED of Peak Stupidity and I am ... sniff, I'm ... sniff, sniff... a blogger. There, I said it!" Regarding "Procrastinator's Anonymous", was it just set up purely for the jokes? "Hi, my name is Jimbo, and I'm a procrastinator. I meant to come 5 years ago, but I kept putting in off, and then it took me a long time to find out where they moved the meetings to..."
Was that a New Yorker cartoon, because, if not, I don't get why I don't get it? * H/T - old Bob Newhart show.